Loved it! There are so many layers to the piece and to the message. Music is indeed, in your heart. It was wonderful that you put notes in the background heart, putting the music in perspective, with music carrying the message, but not THE message. Ohhhhh, thanks so much Rob. I’m so glad you liked this and could appreciate it. I know that you would with the music and all. By the way, have any of my comments been going into your spam folder? I had another blogger friend tell me that my comments were ending up in her spam folder? Hi Staci! No, I have been seeing more spam of late, but not from you. I have had that happen to people who have commented plenty of times, and then suddenly, they’re either in spam, or awaiting moderation. Must be the WordPress gremlins! Hmmmm, makes one wonder eh. Hahaha. Nothing like your beautiful artwork. Yours is amazing. One day, bit by bit, I’ll get there, right. Awwww, thanks Sibella. You’re so sweet. Awww, thanks Richard. I’m such a sucker for eye candy, and seeing all the mixed media around the web has got me somewhat obsessed. I’ve never been a huge artist (like fine artist), but I just can’t keep myself from trying this out. Ohhhhh May, thank you so much. Gorgeous? Wow. Really so sweet of you. I’m sure I’ll really enjoy it. Actually, I just paid for another online course too. I better chill out a bit or my hubby will have a fit. Hahahahaha. Oh Lorrie, you always know how to lift me up. I’m so encouraged by your kind and sweet words. I thought it was about time to start investing just a little more, now that I’m more settled. One of my favorite scriptures for sure. Can you imagine the concerts in heaven…a hush comes across the Angels and someone says. “The Lord is going to sing.” Gives me goosebumps. Isn’t it a great verse. So intimate and free. Oh wow, I’m sure when He sings it’s truly heavenly. Hahaha. Thanks Neha. It’s about time eh. I’ve only been going on about this passion for mixed-media for about eight months (or longer) now. I figured now that I’m more settled it was about time to invest a bit more. 🙂 So glad you liked this first piece. Ohhhh, I love the music notes there Pete. Thank you so much. Ohhhh, thank you so much. Your words have truly encouraged me today. Hi Staci, so happy for you, doing an art course is always a blessing. 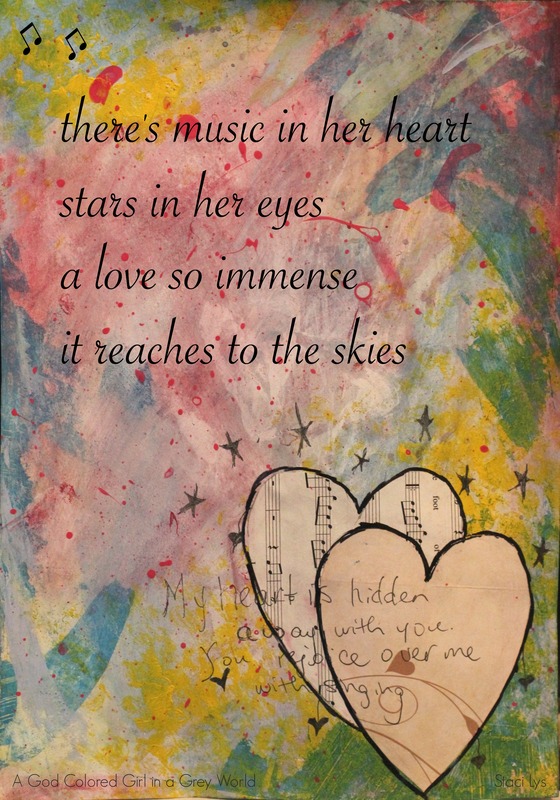 Your card and poem are lovely, if could see you in your poem, music and stars, they describe perfectly you! Awwww, really? They describe me? Thank you so much. Actually yes, I was putting myself in the third person. Thanks again Elizabeth for saying such sweet things. Beautiful result, Stacilys! Sometimes a course can inspire us to create something even more beautiful. Are you going to print it to be out on your wall? It is really lovely! Thank you so much Indah. I’m not sure if I will print this one out. I’m thinking I may print out other ones in the future for the wall in my little creativity corner. However, I will probably print this out to put in my arts portfolio. Thanks again Indah. I’m so glad you like this. Oh great. I’ll go check it out. Thanks Sibella. A beautiful artwork with such a positive message. God is always watching us over. Oh yes, It’s true. God is always watching over us. Thank you so much for the encouragement Alok. Awwww, thank you so much Soldiergirl. I’m so glad you like this piece. And I’m so happy that you shared this with me. I am truly encouraged. Awwwww, thank you so much S. You are so kind. You are also a gift. Oops, I don’t know how I missed this comment. I’m so sorry it’s taken me so long to respond. Wow, I’m honoured that you ‘just had to visit’. Thank you so much for sharing this and for appreciating my efforts. I really like this Staci!! I also make Meme cards using my drawings and Photoshop to insert text and more glitter (I love glitter). I also wanted to thank you for visiting my blog and supporting my work! I will try to come more often to comment on your posts!! It’s so nice to meet people like you! Ahahahaha. Gotta love a blogger that writes to me in Portuguese. Thank you so much. I’m sure your cards are amazing. I’m doing a mixed-media course right now by willowing.com. Have you heard of her? I really like her art. Feliz dia para você também querida. Staci, how exciting, an art course on line. Your artwork is terrific, and your poem is just beautiful. Please enjoy what’s left of the weekend. Ohhhh, I’m so sorry it’s taken me so long to respond. Busy, busy, busy. Anyhow, yes. I’m loving the whole mixed-media thing. Thank you so much for appreciating my efforts and your kind words Pepperanne. This piece of work is simply wonderful, the colours and the choice of words perfectly harmonized with each other to produce the magical affect…once again I am reiterating the words, “music in heart and stars in eye, love so immense to reach the sky”, what power and what a lovely flow in the wording and the meaning…profoundness in its simplicity. cheers to the beauty of art. Ohhhh Nihar, I don’t know how I missed responding to this. Thank you so much for your thoughtful comment and for appreciating my artsy efforts. I love how you said ‘profoundness in its simplicity’. That’s exactly what I want to do here on my blog. I want to share my creations in a simple, yet thought provoking way. I’m so glad you mentioned that. I have been truly encouraged by your kind words Nihar. And yes, cheers to the beauty of art. Yay! This means lots of mixed media pieces. I’m gonna be a happy camper 😃 that is one of my favorite Scriptures. You are so creative, Staci. 😀 Thank you Kirsten. Yes, much more mixed media coming. I love it. Oh yes, I love that verse too.